The engine, MERCEDES OM 603, is of origin but according to the current owners it should have been repackaged in the years 2005. New alternator in 2013. New starter in may 2017. 220V & 12V on board. 2 batteries of 180A/h each, used for the engine or/and for the service. The charger and the batteries are of 2013. Built in 1968 in the Netherlands, this dutch steel cruiser, has 2 side doors and 1 access up to the aft deck. 2 steering positions. The airdraft is just 2,75 m with the windscreen up, 2,15 m with the windscreen down. The aft deck, has a Bimini, is large enough for a table and 2 big reclining chairs. Privacy assured with the hard spray dodgers. The side decks are low enough allowing easy access on board. The entire boat, hull and superstructure, was professionally repainted in 2013 using twin-pack epoxy paint. 8 new anodes. The decks’ paint is touched up every year by the current owners. 2 anchors with manual windlass. The dinghy visible on the photos is no more included in this offer. We enter through the saloon endowed with a comfortable seat and a drop-leaf table. Luminous space. Head linings varnished finish. The door to go down the aft cabin is also the steps to climb up to the aft deck, could be secured with a hook. Headroom of 1,86 m.
The aft cabin has a big bed 130 x 210 cm and a deep wardrobe. Floor with carpet. Headroom of 1,50 m.
The front of the boat is for the galley and the wetroom. In the wetroom there are a basin, a shower and a new electric WC, settled in 2017. Great and luminous space for this galley well set up. Before the current owners, the galley had a table and seats, convertible in a bed for 2 children or 1 adult. Headroom of 1,78 m.
A works campaign has been realized in 2013 : rebuilt of the upholstery, curtains, floors (synthetic material for the saloon and the galley), galley layout rebuilt, new water heater and alternator. Mosquito screen for all the windows. The saloon seats could be transformed in a bed of 90 X 180 cm, since Marsh 2018. 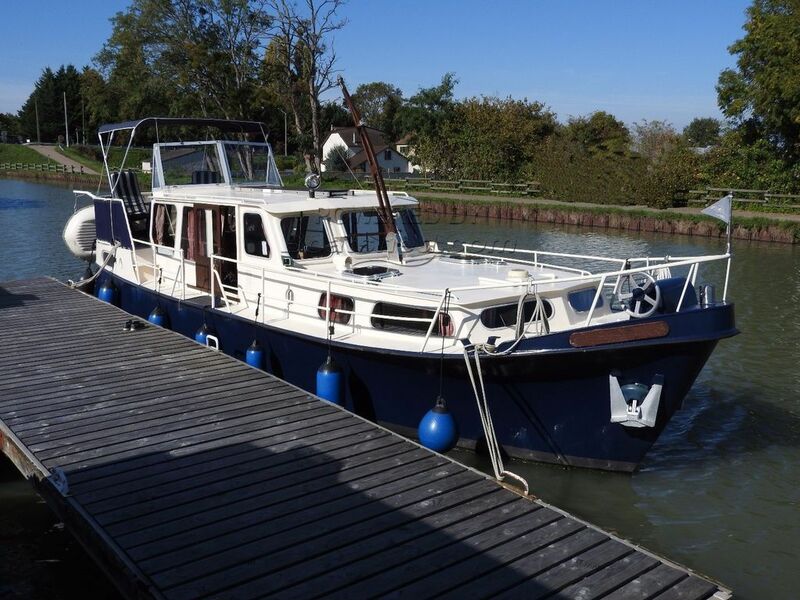 Boatshed Bourgogne is happy to offer this dutch steel cruiser from 1968 , greatly improved and very well maintained, for sale in France. It’s obvious that the current owners are very particular about the maintenance and care of their boat. Everything has its place. One bed in the aft cabin and the seats in the saloon can be transformed in a berth for an occasional guest. Ideal for a couple or small family, this dutch steel cruiser doesn’t look her age, thanks to the numerous renovation works and perpetual cares provided by meticulous and demanding owners. This houseboat, loved and cherished by her thoughtful owners, is ready to cruise ! This Dutch 36 Much Restoration In 2013 has been personally photographed and viewed by Cathy BOUGUEREAU of Boatshed Bourgogne. Click here for contact details.